Welcome to Gulfmann Lighthouses Stamp Collections, it contains with lighthouses and ancient sailing ships related stamps and postcards. 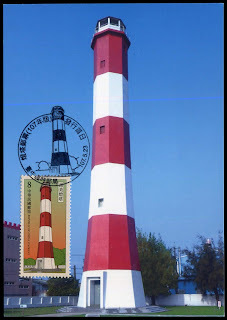 Please kindly send me nice stamped covers with lighthouses or ancient sailing ships stamps and all related topics postcards from your country, i will displaying on my daily updated collection blog. Please let me know all your philatelic comments, also welcome for exchange, please let me know your collections and favorite topics, Thanks. Republic of China (Taiwan) Kaomei Lighthouse maxicard, postmarked on May 23, 2018 from central Taiwan Taichung post office. SINGAPORE ~ Traditional Confections FDC - Singapore Traditional Confections FDC, posted on April 17, 2019 from Singapore GPO to Taipei with arrival postmarked on April 24, 2019. ALAND ~ Aland Woodpecker - Dryocopus martius - Aland Woodpecker - Dryocopus martius ATM maxicard, FDI postmarked on February 1, 2019 from Aland Mariehamn. ROC ~ Herb Plants - Chamaemelum nobile - Republic of China (Taiwan) Herb Plants - Chamaemelum nobile stamps, issued on June 11, 2015.